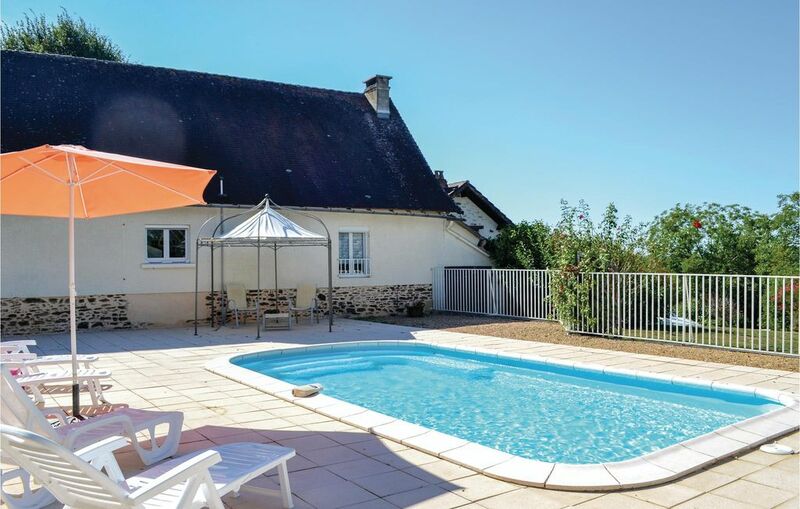 This house is situated in the small village of Sarrazac in a quiet countryside. It is located centrally between the towns of Angouleme, Brive, Limoges and Perigueux, all of which are located within a radius of 50 km. It is an ideal starting point for enjoying many unforgettable excursions in the Dordogne valley. The interior is cosy and features stone walls. A large, covered terrace with a wide view and a private pool are the main attractions of this accommodation. The apartment stands on an authentic farm. Two more residences, one of which belongs to the owner, are located on the same farm. But the apartments are organised so that everyone can enjoy their privacy. Access to bedrooms 1 and 3 is made through bedroom 2.